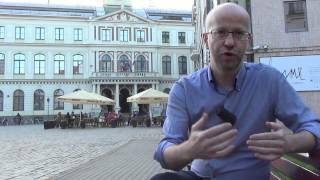 2 Jul 2015 Riga - At the e-IRG Workshop, held in Riga, Latvia, on June 3, 2015,Primeur Magazinehad the opportunity to interview Sergio Andreozzi, Strategy and Policy Manager in the European Grid Infrastructure (EGI), on the topic of the Open Science Commons. The concept of Open Science Commons is very useful to the discussion of the e-IRG Workshop, according to Sergio Andreozzi. Before defining Open Science Commons, Sergio Andreozzi would like to define the two terms of which the concept is composed. Open Science refers to the process of opening the creation and dissemination of scholar knowledge to as many participants as possible. It is a concept that already existed in the 17th century with the birth of the journal systems and which goal it was to offer researchers a channel to disseminate the results of their work. It was a step towards opening science in terms of opening its resuls. Nowadays, we can do a lot more thanks to the development of new technologies such as the Internet. Science has become digital. It is possible to think about large research collaborations, thousands of researchers who collaborate together, not only to disseminate research results but also to make science. The openness also involves the creation of scientific results. This ranges from generating ideas, defining possible research goals, to the gathering of data, access to open data that is possibly available on the Internet, to using large-scale infrastructures, tools and software to analyze data. Open Science nowadays also involves a broad amount and types of resources. Sergio Andreozzi thinks about the need to share data. This involves resources such as scientific instruments, digital data, e-Infrastructures, access to large-scale computing capabilities - this could be commodity computing or supercomputing - ans also services to manage data. Finally, it is very important to access expert people, the intellectual capital of experts who can support researchers so they can better execute their jobs. The question is: How do we manage all these types of shared resources, in a way that their value for the researchers is maximalized? Here, the concept of the Commons enters into play. The Commons is a way, an approach to govern shared resources within a community in a way that researchers feel engaged in defining the rules to govern the resources, to share them in a way that their value is maximized. We can see the Commons already applied in a number of sources. For instance, in software we find Linux as a type of Commons where basically there is a number of defined rules from the community where software engineers can provide a contribution to a common database. There are rules to define how this is accepted, how to get results, and so on. Another type of Commons in the digital era is Wikipedia where a large amount of people contribute to build the common knowledge base. They feel engaged and there are clear rules for them to engage in order to develop this common shared body of knowledge. In the infrastructure area, we see that the concept of Commons is applied to infrastructure resources such as GEANT. A few years ago, a high level expert group defined a roadmap to evolve the governance bodies towards becoming a Communication Commons for the knowledge communities in Europe. Later the Commons concept was expanded towards other infrastructures. e-IRG came up with the vision of an e-Infrastructure Commons where basically all the infrastructures are interoperable, integrated and easy to access for the research communities. With the Open Science Commons, we are taking a step forward, according to Sergio Andreozzi. We recognize that Open Science requires not only communication infrastructures but also other types of resources that need to shared and governed by the community. For instance, we have data, we have experts, people who can support researchers in doing their work - if you think, for example, about the concept of e-Science centres. All the types of interrelated resources that are needed for science can be managed as Commons. We should not see the Open Science Commons as a unique gathering of all the resources but there are different types of Commons, each with their own governance, according to the principal of committed participation of the users who can influence the rules to access the resources and so on. Once this is implemented, the vision should be that researchers from all disciplines have access to all the services they need and additional services such as knowledge expertise and instruments that enable them to collaborate and to achieve excellence in science but also that they feel engaged to govern these resources in defining the rules for further evolution. To pick out an example in the area of data, we can see the Genome Data Commons which is the public availability of all data, coming from the Human Genome project, that was made available according to well-defined rules, stating when the data should be available and to what kind of groups. A later project in the genomic area also followed not these exact rules but a similar type of approach and can be considered to act as a kind of Data Commons, because the rules were defined by the community, in a way to guarantee a non-discriminatory access to the data and the public availability to this data without restrictions, generated in a huge societal way to this sector. In network computing, Sergio Andreozzi forsees the creation of a European backbone of tools and resources that come from the individual member states that contribute to the creation of a generic infrastructure on top of which different research infrastructures of the long tail can build their own research platforms. This can be structured as a Commons if individual institutions of each country can contribute to a certain pool of resources or common infrastructures; and if they can offer these capabilities which answer to open standards and do not create artificial lock-ins; and if there is a clear governance defined at different levels, from the local to the national and to the European level, that enables the communities who use the resources - which could be ESFRI projects or the long tail representatives - to define and participate in the evolution of this generic Commons Infrastructure in a way that this can follow their needs, in a way so that they can establish rules for different communities to access the available capacity, which is not discriminatory for them. The standards can be seen as instrumental to create the Commons, to make the sharing of resources available, to enable, for instance, even the coexistence of resources coming from the private sector or from the public sector. As long as they are based on open standards, communities can have the freedom to participate and choose what best fits their needs without creating artificial enclosures or lock-in to a certain provider. The users can also participate in the trends and evolution of the services provided by the private or the public sector and can have a role in defining how these resources are being shared within the community. With the Open Science Commons, Sergio Andreozzi believes that we are at the beginning of an interesting journey of applying the Commons principle to a wider set of shared resources, not just infrastructures but also other types of resources, and he understands that there is lots of work to be done for the future.